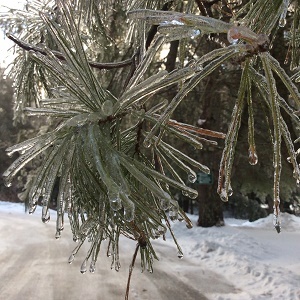 March may not be the prettiest month in Vermont, but it sure is the sweetest! Abbott’s Glen naturist Inn has been cooking with maple syrup since the inn opened in 2004. I have several cookbooks that I call favorites and many have a maple theme. Given that we also make our own syrup here every March, we have a plentiful larder of sweet golden syrup to adorn pancakes, sweeten up a salsa, give sauce a glazey sweetness & making a wicked batch of maple walnut granola. 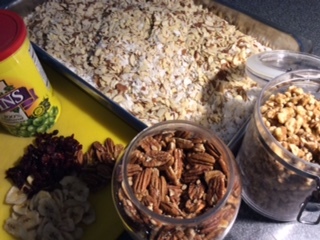 Granola is always part of our country continental breakfasts. Many of our guests were asking for the recipe so here it is. If you are not into making a batch for yourself, stop by our inn gift shoppe & pick up a bag. Preheat oven to 350. Line a 15 x 10 inch rimmed cookie sheet with parchment paper. In a small saucepan heat oil, syrup, sugar, cinnamon and salt. 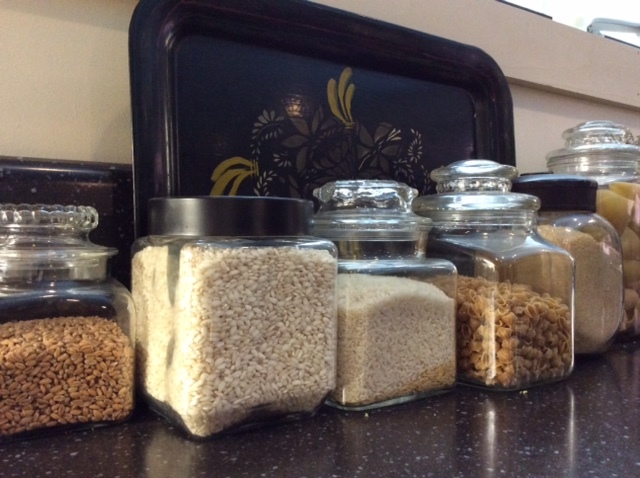 In a large bowl, mix together oats, nuts, seeds, coconut, wheat germ & bran flakes. Feel free to add some 1/4 cup flax meal for added nutritional benefits. Pour the syrup mixture over the oat mixture & stir to blend. Spread the granola evenly in the prepared pan. Bake 15 ~ 20 minutes until deep golden brown. Reduce the oven temperature to 300. Gently turn the granola with a spatula, trying not to break up clumps. 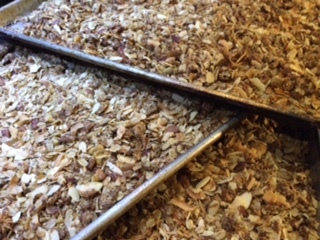 Continue cooking until the granola is brown & not sticky to the touch. Add 2 cups of dried fruit in whatever proportion you like. Our favorite is craisins, currants, chopped dates & apricots. If you have visited Abbott’s Glen or follow this blog, you know we love pancakes! I am always looking for healthier versions with a new twist on the standard hotcake. I found this recipe in a Saveur magazine and dog eared the page. Since I had a fresh pint of blueberries just waiting to be utilized, I decided to make this fabulous baked pancake. One tip: don’t exclude the lemon crema. The lemon zest in the sweetened sour cream brings the pancake s final topping all together with a wow…………. LEMON CREMA: Mix 1/2 cup sour cream, zest or juice of 1 lemon, 2 tbsp sugar together. Heat oven to 350. Boil quinoa, cinnamon & 1/2 cup of water in a 1 qt. saucepan.Reduce heat to low & cook 10 minutes, covered. Remove from heat, remove cinnamon sticks,& let cool. Combine flour, 4 tbsp of sugar, baking powder & soda & salt & stir.In a separate bowl, whisk quinoa, buttermilk, milk, & eggs. Add to dry ingredients until batter forms. In a cast iron pan, heat oil or butter, over medium heat. 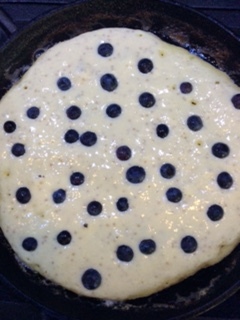 Ladle 1 1/2 cups batter into pan & add 3/4 cup of blueberries & cook for 3 ~ 4 minutes. The flip. Cook 2 more minutes. Transfer to the oven, & bake until it is crispy. Repeat this 3 more times. 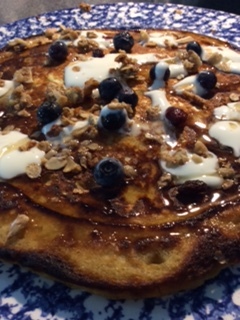 Top each pancake with dollops of lemon crema, more fresh blueberries, some granola & a generous drizzle of maple syrup. Our guests loved it! I portioned each pancake into 8 pieces. Most guests ate 2 or 3 wedges. As the owner & chef at Abbott’s Glen Naturist resort in Vermont, I always look forward to the sweet month of March. Sweet because that’s when sugaring begins. If you are unfamiliar with that term, it means drawing off sap from the maple trees & boiling it down until you have that golden amber maple syrup. March we host theme dinners celebrating the new syrup. Each course of the dinner highlights some maple in the recipe. 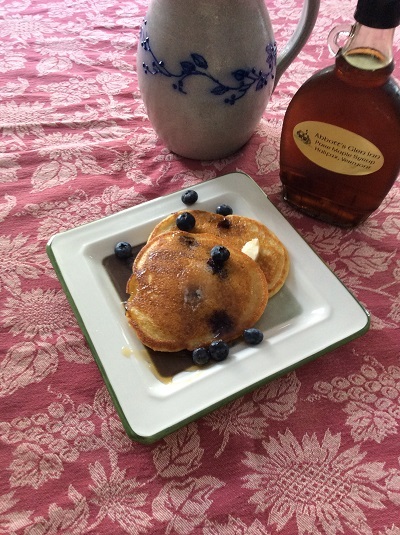 Guests are also treated to a hot stack of buttermilk pancakes for breakfast with a warm cruet of syrup to pour a top. Did you know it makes a fabulous marinade for salmon? How about a sweet potato & Peanut soup? How about enhancing your roasted veggies with a drizzle? Add some Maple syrup to your morning smoothie? Now that I have you thinking let’s get cooking. Just promise me you won’t use the fake product you find on your supermarket shelf. 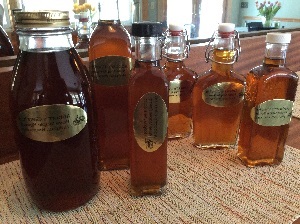 The real maple syrup is worth every penny..
1 1 ~ 1 ¾ lb. boneless salmon, skin on. In a large baking dish stir soy sauce, syrup, vinegar, ginger, & red pepper. Lay salmon skin side up in marinade. Preheat oven 425. Line a roasting pan with aluminum foil. Lay fish on the foil, skin side down. Roast uncovered until fish for 12 minutes. Pour the marinade into a sauce pan & cook down until syrupy. Pour it over the fish & serve with thinly sliced scallions. Parsley or chives to garnish. Heat butter in a large heavy skillet over medium high heat. Add shallot & cook stirring 1 to 2 minutes until soft & browned. Add water, syrup & cinnamon. Increase heat to high & bring to a boil. Add carrots & return to a simmer, stirring occasionally. Cover, reduce heat to medium to maintain a lively simmer, 4 ~ 6 minutes, until crisp tender. Remove lid & stir in vinegar. Increase heat, continue to cook until liquid has thickened & carrots are coated. Sprinkle with fresh chives or parsley. 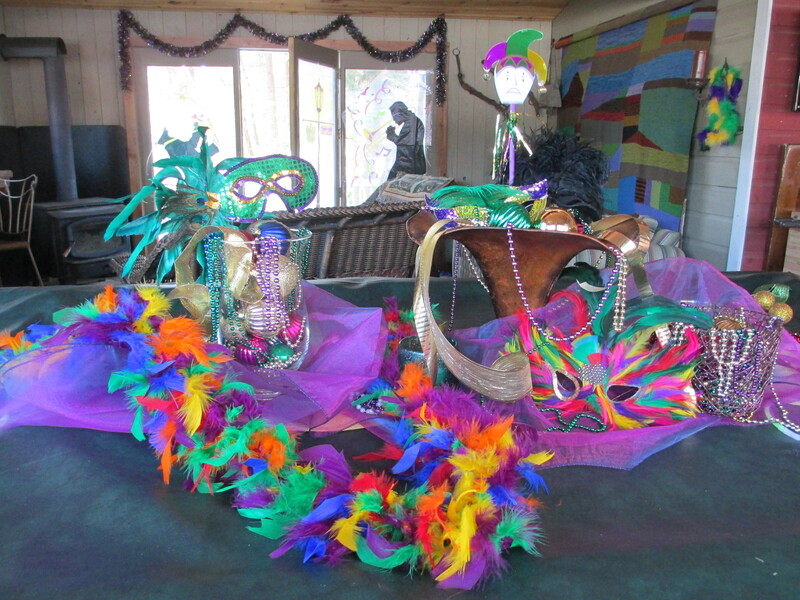 We celebrated Mardis Gras at the Inn last Saturday night. What a fun event this is. Guests arrive for our theme weekend with masks, beads & funky hats. 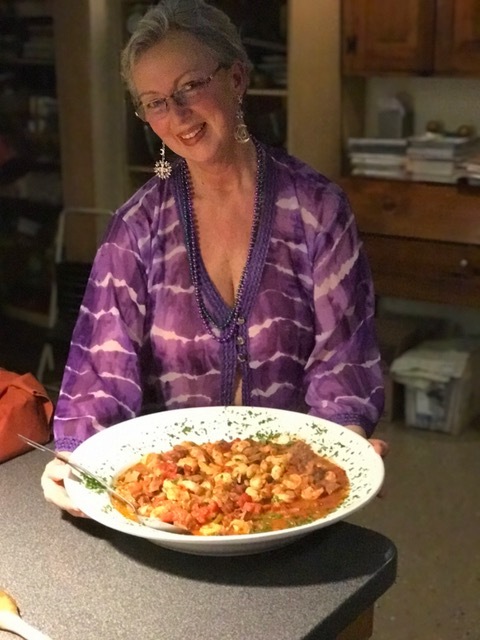 My husband Lindy makes sure we have music to accompany the weekend from zydeco to Harry Connick Jr. We deck out Club Sugar Shack with all kinds of Mardis Gras regalia to create a fun & festive feeling for the party that will follow a great dinner. 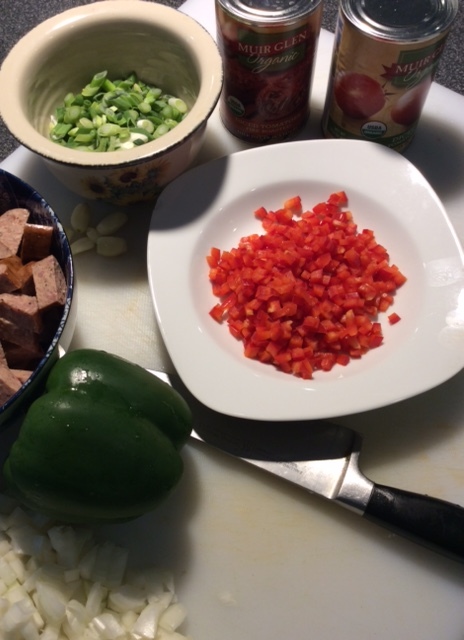 This year, I decided to veer from my tried & true recipes from Gourmet , & try a few new ones. 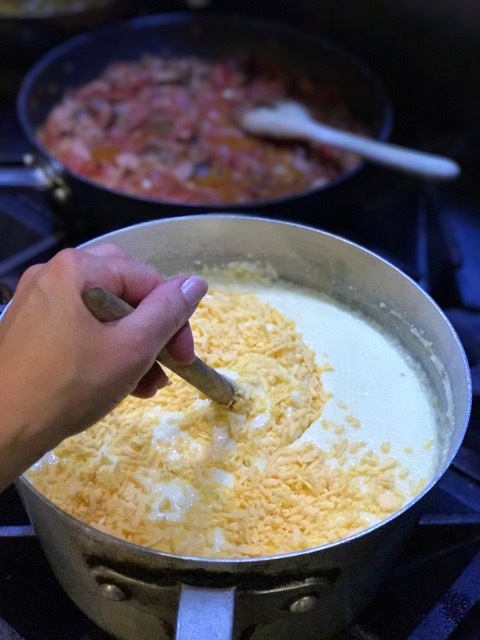 Our dinner menu this year was a fabulous Shrimp & Andouille sausage melange served atop a mound of creamy cheddar grits. 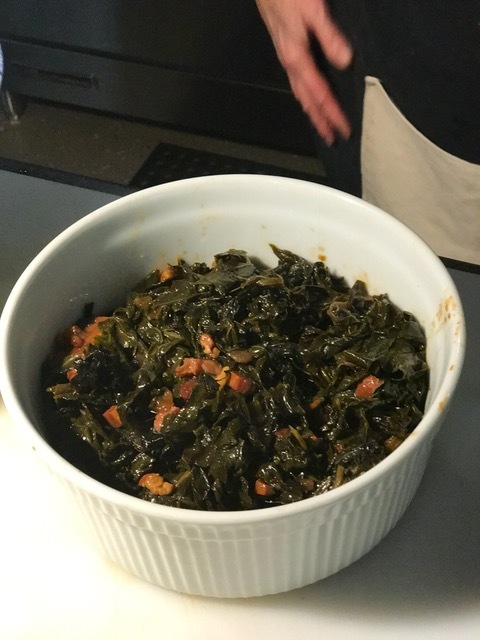 To accompany it, braised collards with bacon, brown sugar, onions & Worcestershire , came together with a splash of red wine vinegar. 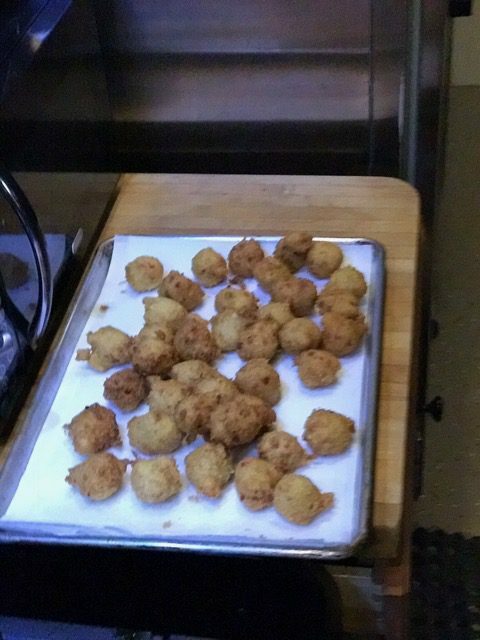 hushpuppies, with bits of red peppers , were placed on dining tables for guests to enjoy. Biting into the crispy crust & cheesy cornmeal interiors , one had to restrain from eating them all . Remember, sharing is a nice thing to do! The one recipe I did prepare, that is always a favorite for this menu is sweet potato pie. A dollop of sweetened cream & a good cup of coffee & we were ready to head over to club Sugar shack to dance away the night. Heat oil in a large heavy bottom soup pot.Add bacon & cook until lightly browned. Add onion & garlic & cook until softened about 5 minutes. Add collards & just enough water to cover the greens. Add ham hock, salt & bring to boil, then reduce heat to a simmer. Add bouillion to the pot & stir until dissolved.Then add brown sugar, barbecue sauce, Worcestershire sauce & hot pepper sauce. Stir, then simmer for 2 ~ 3 hours uncovered. Add additional water, 1/2 cup at a time, if necessary to keep greens stewing but not drowning. For shrimp: Heat a large skillet over medium heat. Add bacon & cook until crisp. Transfer to a plate lined with paper towels. Add onion & pepper to bacon drippings in skillet & cook until soft. Add garlic & cook 1 more minute. Add tomatoes & stock & bring to a boil. Lower heat & simmer 5 minutes. Add sausage & cook 5 more minutes. Add salt & pepper. Add shrimp , cover 7 cook until shrimp are cooked through, 4 ~ 5 minutes. Add hot sauce & parsley., & stir. Heat milk & stock in a large nonstick saucepan over medium heat. Gradually add grits, stirring constantly, about 10 minutes, until mixture thickens. Add butter, stir, & add cheese, 1 cup at a time. Cook until grits are thick but not runny. If too thick, add milk a Tbs at a time. Add chopped scallions & black pepper. In a medium bowl mix cornmeal, flour, baking powder, sugar & salt. Add cheese, onion, & red pepper, toss to combine. Make a well in center of flour mixture. In another bowl mix egg & beer. Add at once to flour mixture. Stir just until moistened. In a large vessel, I use my wok, heat oil to 375. For each hush puppy, drop 1 rounded Tbsp. I use a small ice cream scoop. Fry 3 ~ 4 at a time until golden brown, turning once. Drain on paper towels. I hold them in a low oven while the remaining hush puppies fry up. Serve them up with some pepper jelly. In case you are wondering , 128 calories per. Oh my, you do the math! Every weekend, I prepare dinner for our inn guests. Unlike most restaurants, I create a new menu each weekend. Most of my dinners include a special salad. This weekend I made a romaine salad, which included Compari tomatoes, Swiss cheese, maple bacon,& toasted almonds. A light lemon vinaigrette with garlic, pulled the whole salad together. All of my guests asked for the recipe . So here it is for all to enjoy. Prepare the dressing in a jar, shake & refrigerate. Tear romaine into a large bowl. Add tomatoes, bacon, cheeses, almonds & croutons. Toss . Add dressing just before serving. I followed the salad with a Shrimp & Andouille Sausage served over cheddar grits. A great comfort food dinner. 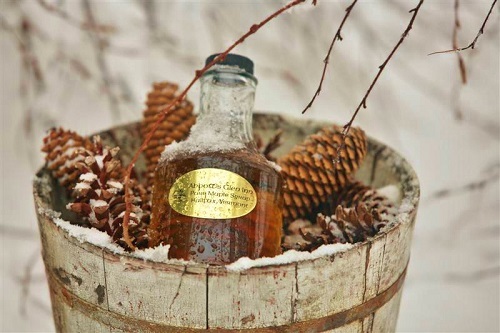 Every January, Abbott’s Glen hosts a sleigh ride weekend at Adams Farm in Dover Vermont. Our guests join us for an iconic winter experience. We dine earlier in the evening so we can reach the mountain for an 8:00 departure. A team of 2 draft horses ascend the mountain pulling 20 blanket covered guests over the snow covered meadows under a sparkling winter night sky. Once at the cabin, we unload to let let the horses rest awhile. We are greeted by a member of the Adams family who offers up some hot chocolate .The cabin is lit by kerosene lamps. A wood stove for heat & an old player piano allow for some ole time entertainment & warmth. I always plan an easy home style meal that echoes a country feeling. So a home made chicken pot pie seemed like a perfect fit. 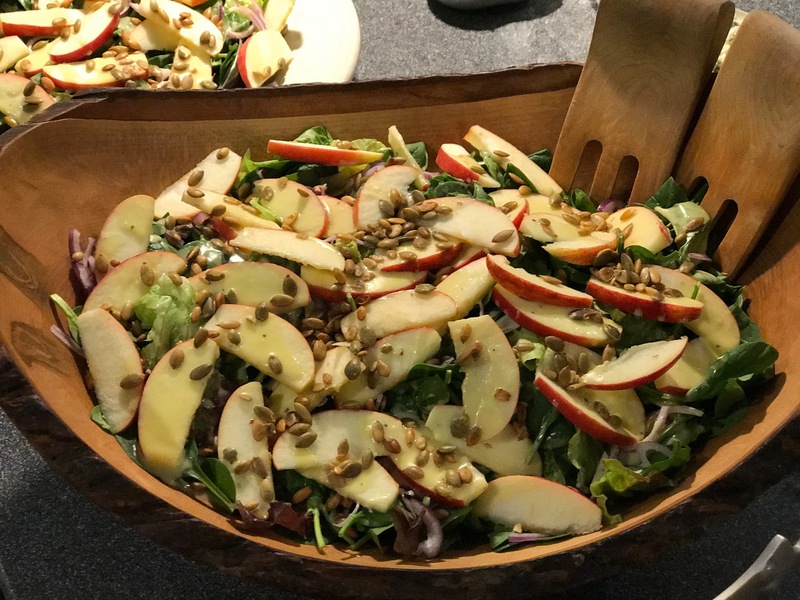 We started the meal with a spinach salad with sliced pink lady apples, thinly sliced red onion, & salted pumpkin seeds. It was offered with blue cheese & a home made honey Dijon dressing. 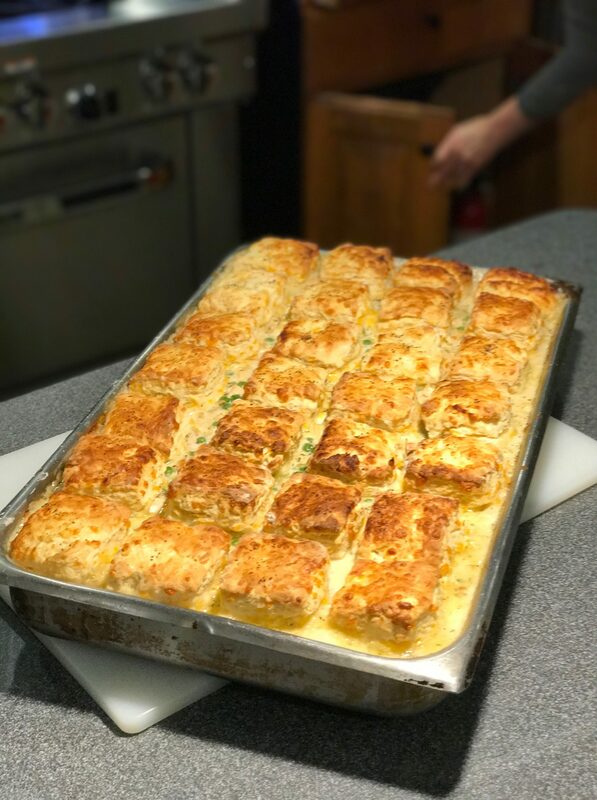 The chicken pot pie with a cheddar biscuit topping was satisfying and delicious. Most of our guests had as second helping and everyone asked for the recipe. 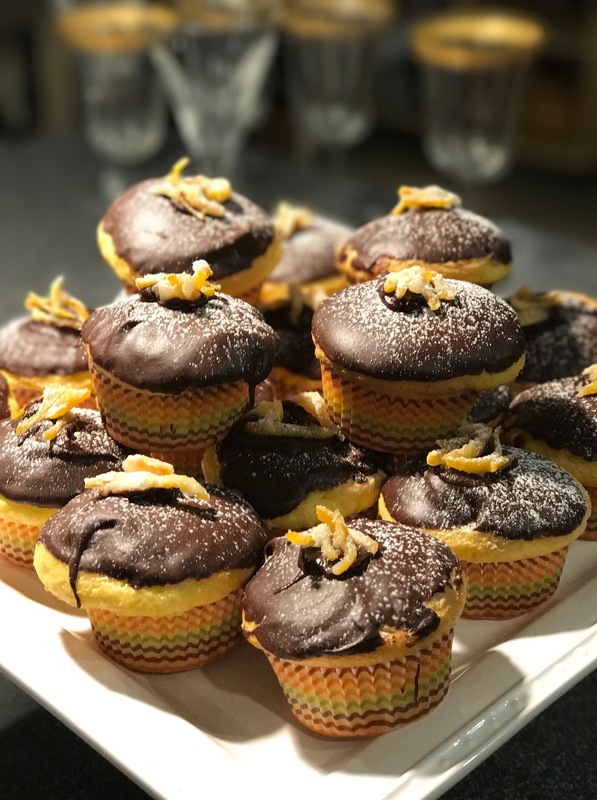 When we returned from mountain , we served a platter of golden cupcakes with a chocolate ganache , topped with fresh sugared orange peel. Coffee & a warm fire was all the guests needed to rev them up for the from the remaining night of dancing in Club Sugar Shack. Winter in Vermont can be long. Often there are many gray days in a row. It’s easy to feel a little blue & lethargic. My remedy for the blues? Head into the kitchen & bake something comforting. Chocolate usually does the trick. 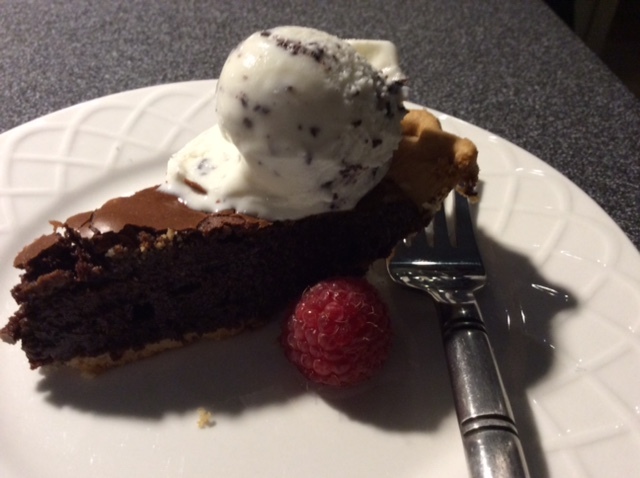 I found this decadent brownie pie recipe in Ken Hadricks’ cookbook appropriately titled” Comfort Food”. I have been using a lot of his recipes this January. I have prepared several pots of soup, many 1 pan main dishes, & a few desserts. 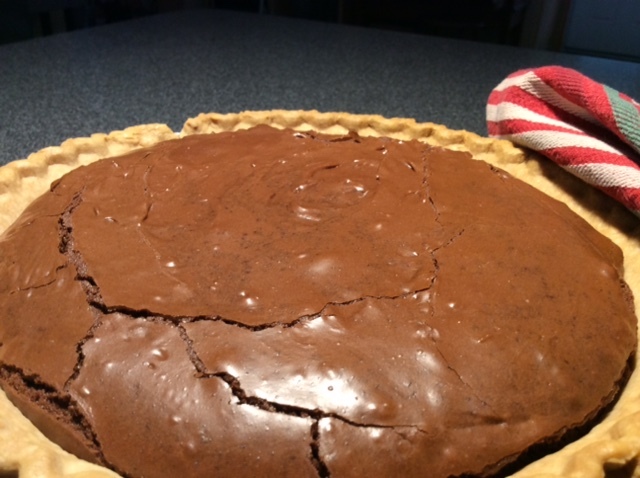 This brownie pie may become a favorite. I chose to top with a peppermint gelato and my guests loved it. Sweetened whipped cream would also be terrific. Melt the butter in a saucepan over medium heat. Add 1 cup of chocolate chips & heat for a few minutes more, then remove from heat. Stir until chips are melted. 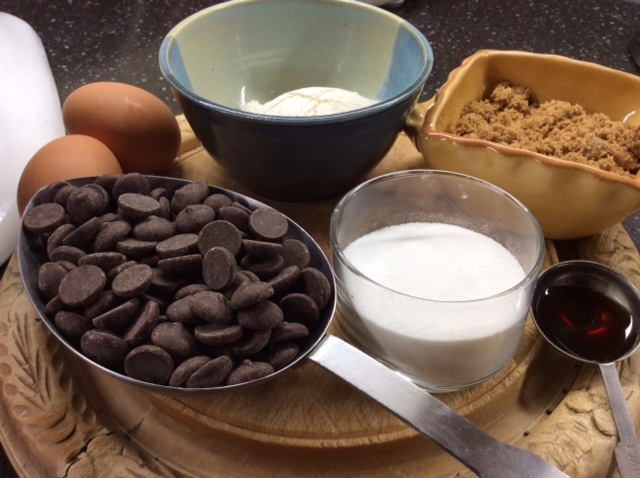 In a large bowl, combine eggs,sugars & vanilla & whisk until evenly blended.Add melted chocolate & stir. Add flour & salt & blend. Add remaining chips & nuts. Scrape the filling into unbaked pie shell & smooth top. Bake for 30 ~ 35 minutes. Do not test with a tooth pick in middle as it should be fudgy. Note: this is very rich so smaller pie wedges will still satisfy that chocolate urge.